Today is Pancake Tuesday, one of my favourite days of the year. When I was young, I used to come home and my mother would make us extra thin pancakes, rolled up with jam, sugar and lemon. We’d gobble them down, they were absolutely delicious. I’ve never really been able to recreate her pancakes and Pancake Tuesday has never really been the same since but I have got quite good at making American-style pancakes and I’ve decided to share what might be the easiest pancake recipe of all time. And, just so you also learn English I’ve added some definitions for the more difficult words. Just click on the word for a dictionary definition. Take a mug of flour and sieve it into a bowl. Fill the same mug with milk and pour that in. Add a pinch of salt and a pinch of sugar. Melt some butter in a frying pan on a low heat. Ladle in some of your pancake mixture and when you start to see some bubbles on top, flip it over. When the pancakes are nice and golden, serve them up with some fresh fruit and syrup. It’s not quite how mother used to make them but they tick my boxes: easy to make and delicious! So, try them out and let me know how they go…and hopefully you’ll learn English words along the way as well. 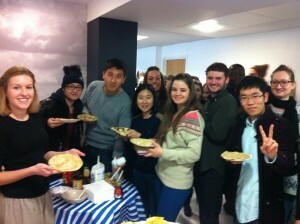 Here’s a few students at EC London enjoying their pancakes. Now it’s your turn! Try out our learn English website if you’d like to learn English vocabulary. Have a look at our main website if you’re thinking about booking some adult English courses in the UK.